In many remote field camps in Antarctica, you can't take a shower or wash your clothes, but here at WAIS camp, we had washing facilities for ourselves and our clothes. The washer was like ones that your great-grandmother might have used, so we wanted to show you the steps our team used to wash clothes. We helped, but luckily we didn't have any clothes to wash.
Before you wash, you usually get 50 gallons or more of snow and put it in the snow melter. Opening the snow melter took both of us and someone had to help us pour the snow in. You could use a shovel or just pick up the trash can full of snow and pour it in. The snow melter provides cold water. So you have to figure out some way to warm it. We had a solar warmer for water in the shower, but for the washer we boiled water on the kerosene heater. There was always water boiling there. 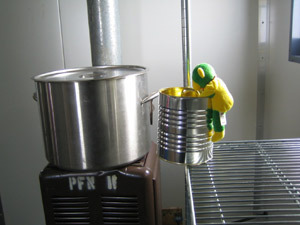 OzGold took a large can and dipped out boiling water and carried it over to the washer where we poured it in. We usually didn't use more than two cans of boiling water unless there were a lot of clothes. I was in charge of the actual washing. 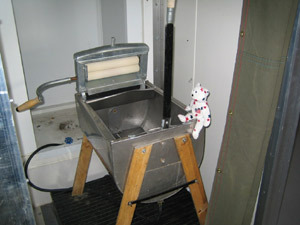 After the water, soap and clothes were put into this washer that I am sitting on, I pulled the black and forth. This was like the wash cycle in your automatic washer. It moves the clothes back and forth through the soapy water. 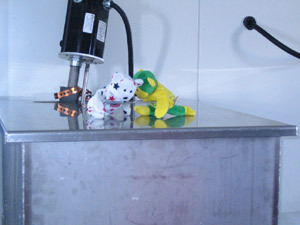 Then you drain out the soapy water through a hose connected to the bottom of the washer. To rinse the clothes, you do it all again without the soap. 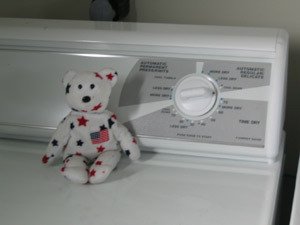 An automatic washer has a spin cycle that gets a lot of the water out of the clothes. This machine has a "mangle" or two rollers. 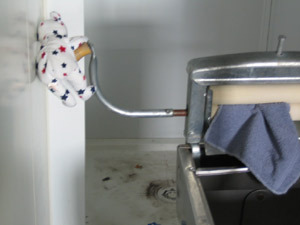 You put the piece of clothing between the rollers and turn the crank. This presses the water out of the material. Thick clothes take two or three times through the mangle. It's good exercise. We were very lucky because there was an electric dryer at the camp. So we could just pop our clothes in and get them really dry. 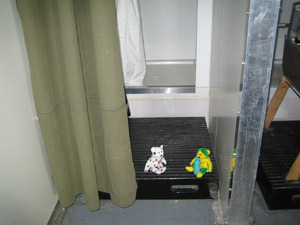 You don't want to have wet clothes in Antarctica. That could cause hypothermia and that is dangerous. Hypothermia is when your core body temperature gets too low and it is something you can die from if you get too cold. So dry clothes are very important!